Blendy Knits Again, and this time it’s not just socks! Grab your needles and your favourite sock yarn, then ponder over which charming pattern to choose from the second book New Zealand knitting designer, Belinda Too (Blendy) has created. 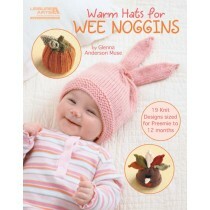 Following on from the success of ‘Blendy Knits Socks’, this new book offers 25 patterns to suit just about everyone – cute hats (including the WotWots hat pattern! ), legwarmers for all ages, delightful fingerless gloves, lace scarves, socks (including larger sizes) and gorgeous cardigans. 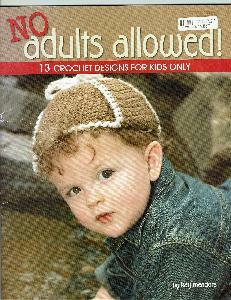 The patterns are relatively easy – just clever placement of basic knitting stitches with a few modern twists. And they have been designed with yarn efficiency in mind – you know your project is complete when you have used up all your yarn. 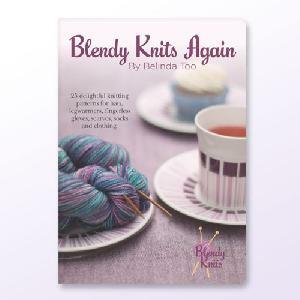 It’s time to get knitting – join Blendy as she Knits Again! Whether you're a new knitter or just want to try new techniques, this must-have resource offers all the knitting know-how you'll ever need. With over 1,000 close-up photographs featuring real hands holding real yarn and needles, there's no easier way to learn! Want to expand your wardrobe, your hobbies, and your social circle all at once? Start knitting! Beyond the Scarf is a great beginner’s guide to learning basic stitches through sophisticated "Trust me, I know what I’m doing" designs and fun novelty yarns. There are even complete materials lists and yarn suggestions for each project and every budget. Lumpy slippers and bumpy mufflers will be but a dim, unpleasant memory once popular authors Kathleen and Nick Greco get a hold of your needles and your imagination. These seven patterns by Lisa Gentry are based on the styles snapped by paparazzi from East Coast to West. Choose from five fabulous fashions for adults. Small children will look camera-ready in a semi-plaid beanie, while older children will adore their fun, textured toppers. 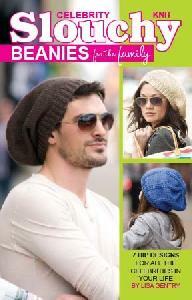 Pair any of these beanies with large sunglasses, and let the world wonder--who's that celebrity? You've seen them in magazines. You've watched them on TV. The rich and famous are wearing slouchy beanies wherever they go, and they look amazing! Now you can knit seven designs like those worn by movie stars, television personalities, and musicians. State your celebrity style in one of five high-fashion beanies for adults. If you know a toddler who loves to look adorable, make that tot a bright beanie with horizontal stripes! An older child will shine in the spotlight of your attention while wearing the two-in-one reversible beanie. All of the hats in Knit Celebrity Slouchy Beanies for the Family were designed for medium weight yarn by the talented Lisa Gentry to be great for casual days and every day--as well as for dodging the paparazzi! Crocheting accessories can be a quick, simple, and rewarding way to enhance a wardrobe—and build needleworking skills. Thanks to Francine Toukou, these sophisticated patterns have a distinctively urban edge, sassy design aesthetic, and imaginative use of color. Stitchers of every level will want to grab their hooks and dive into such fashionable projects as a lovely pink mohair neck wrap with frilly, feminine edges; a snuggly brown scarf, worked in chunky wool and featuring flower attachments along its length; and a fabulous elongated clutch with a snap closure and decorative medallion. In addition to the basic stitches, Toukou offers invaluable advice on working with budget yarns and mastering special skills, including tassel-making, felting, and appliqué. Who’s the top designer this season? You are! Exclusively You makes it easy for you to create nine one-of-a-kind handbags and accessories. It’s as simple as combining crochet with our premium Faux Leather and Mock Croc elements. 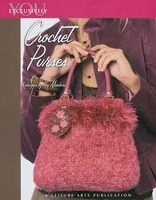 Crochet the Posh Cloche, then make a matching handbag with Exclusively You purse handles. Or create the Oops Loops Clutch of Mock Croc to go with a loopy crocheted scarf. Even your spare change can be kept in the stylish, folded Metro Coin Purse. These unique designs and more – the Racing Stripe Scarf, Vertical Verve Purse, Clutch and Go, and Horizon Haze Purse – are yours to fashion and enjoy. Make this season’s accessories everything you want them to be, with design elements from Exclusively You. 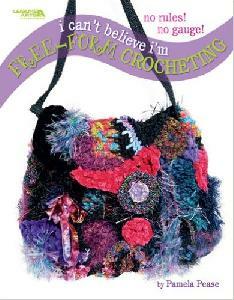 Exclusively You offers 6 stunning designs to crochet. Fashion a felted bag, a mohair clutch, or a granny square purse with Mock Croc patches. 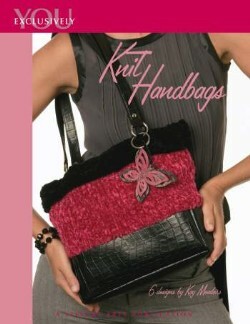 Make a handbag that combines ribbon yarn with eyelash yarn, or create a short or tall box bottom purse. The handles and many of the special trims are already complete and ready for your use. You get the beauty of Faux Leather and Mock Croc, plus the rich texture of crochet-and also get to say "I made it myself." Paperback: 20 pages. Fashion your favorite yarns into six stylish knit handbags. Knit a Mock Croc box bottom bag using chenille yarn. Create a handy clutch purse topped with a Faux Leather flower. Have you seen how the sweet little bubble bag gets added shape from a Mock Croc strip? Too cute! Whether you want a roomy messenger bag, a sassy drawstring bag, or a dressy felted purse, Exclusively You has everything you need to make it special. Knitting comes out of the parlor in this edgy collection of modern designs for knitters who want their personalities to come through in their projects. More than 30 patterns, including a cozy hoodie, a key chain, and an easy-care cactus stretch a knitter's repertoire beyond simple scarves and hats. The themed sections take intrepid handcrafters from an "Urban Playground" to "Home Comforts" while an introductory chapter covers knitting terms and techniques so novice knitters can skip the fuss and get right down to the knitty-gritty. A variety of yarns are used, fueling mix-and-match creativity, and there is even a market tote to knit from old plastic grocery bags. 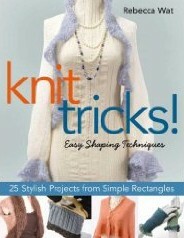 Always unpredictable and never square, the new projects in this book will spark creativity in hip knitters everywhere. Everyone loves granny squares, but we bet you've never seen them like this before. These creations are colorful, comfortable, and so much fun! From a bright floral wrap to a fringed afghan, the six designs have fresh appeal. They're absolutely lovely to share as gifts, you'll also want to crochet a few for yourself! 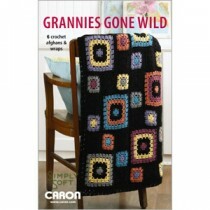 Grannies Gone Wild presents 6 crochet afghans and wraps using medium weight yarn and requiring Easy skills for five and Experienced skills for one: Go Check on Granny afghan, Funky Granny Wrap, Granny on the Corner wrap, Christmas Granny afghan, Grannies Gone Wild Afghan, and Deep Sea Granny afghan. Anyone can do free-form crochet, because gauge, pattern, and yarn weight don't matter; you ignore all rules! You can make a hat, a scarf, a purse, a wall hanging, or whatever appeals to your creativity. Just mix and match yarns to crochet a variety of shapes in whatever colors and textures you wish; then glue, sew, or crochet these "scrumbles" together in a form that pleases you. You can even "reupholster" old purses, eyeglass cases, makeup bags, and pillows with scrumbles. To help you get started, designer Pamela Pease shares instructions for her favorite scrumble shapes. Once you're comfortable with the idea of fashioning your own scrumbles, have fun following your impulses to invent original designs with dimension and style! Forget shoes - readers can take their sock addiction to new lengths with an inspiring mix of cozy, quirky and chic sock designs in Knitting Socks Appeal. Included are projects such as pedicure socks, chic retro leg warmers, tiny tiger feet and even unique stripy socks for dad. Variation designs will tempt readers with a colorful range of irresistible sock yarns and stylish embellishments such as pompoms, beads and ribbons complete each pair. With clear patterns, stylish photography and easy-to-follow technique instructions, even novice knitters will be able to treat their feet. 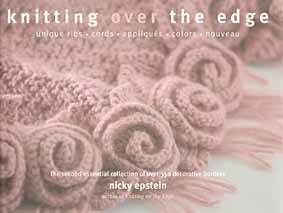 Practically every knitted project needs an edging, and with her hit knitting reference, Knitting on the Edge, Nicky Epstein took the humble traditional rib to new heights. She now proudly presents a companion volume that's equally informative and rich in designs. 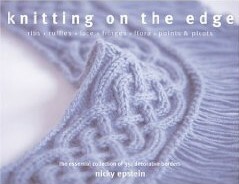 Knitting Over the Edge takes the craft further, with more than 300 unusual edge combinations and shapings that will add a special, unique touch to any piece. 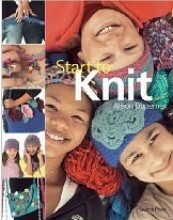 The striking patterns will keep knitters of every level busy experimenting with different types of ties, loops, knots, braids, twists, bobbles and more. The topics explored in depth include cords, appliqués (such as flowers, leaves, hearts, and geometrics), color work, and a host of truly extraordinary corners, angles, bindings, and closures. Sweaters are the ultimate showcase for knitters—but most patterns require tricky and complicated piecing. These don’t…and they look fantastic, too! The seamless, top-down knitting method eliminates challenging construction, allowing knitters to focus on the individual details that make each sweater special. Not only does this guide thoroughly explain how the technique works, but it also teaches beginners how to design their own generic patterns for pullovers and cardigans in different yarn gauges. All the sweaters are organized by yarn weight, and the projects include an elegant rolled-collar pullover, dramatic capelet, and Asian-inspired top. This collection of yarns and designs for accessory patterns are perfect for summer knitting, small and satisfyingly quick to complete. 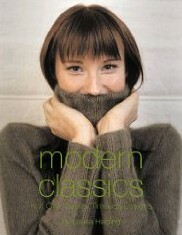 Take a timeless approach to knitting with 20 classic styles that spotlight a distinctly modern twist. In tapestry crochet, the artisan works with smooth yarns or threads in a variety of colors and a comparatively small hook in relation to fiber size. Those colors not currently in use are carried within the piece until needed again. The result is a dense fabric somewhat reminiscent of woven tapestry. Ventura first discovered tapestry crochet as a Peace Corps volunteer in Guatemala when she acquired some of the colorful tapestry-crocheted shoulder bags that are part of traditional Maya male attire. 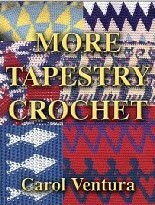 This book includes an illustrated history of tapestry crochet, expanded information on natural fibers, and many new projects, including hats, baskets, bags, and pillows. Ready, Set, Knit Cables gives the many new knitters all the basics and beyond plus hip projects, in a cool stand-up format. Knitted cables are intriguing patterns of stitches that crisscross, twist, and braid their way up through the knitted fabric. Their texture and depth have a magical allure that draws knitters to want to learn how to knit them. Though surprisingly easy to master, cabling is an intermediate level skill that opens up a vast realm of possibilities for knitters-a boon for the knitter as well as the yarn shop owner. Ready, Set, Knit Cables teaches a variety of cable patterns and techniques in an easy to follow format that ensures success for beginners and intermediates alike. Twenty different cable patterns are presented in step-by-step instructions with photographs. Knitters will learn how to read charted cable patterns as well as directions that are written out row by row with abbreviations. Ten complete projects are included to give knitters interesting and unique ways to show off their new cable skills. 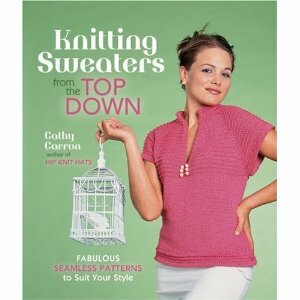 Other cable knit titles (listed below) are designer driven, high end books that are priced much higher than Ready, Set, Knit Cables. In a flip through the pages, they seem intimidating and overwhelming. In welcome contrast, Ready, Set, Knit Cables is presented in a unique format that allows the book to be propped up at eye level while learning. The appearance is crisp and uncomplicated, engaging the reader from the first glance. Because there are only a few techniques to learn, this introductory guide to knitting is perfect for young crafters eager to start a new hobby. Featuring a chapter devoted to basic terms and definitions, absolute beginners can quickly learn how to make brilliant knitted items—from scarves, belts, and bags to purses and beanie hats. Each project is set off by bright, full-color photography, lively designs, and creative ideas for adapting the patterns to other one-of-a-kind projects. 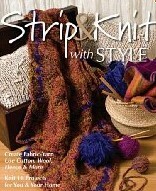 Knit 16 fun, fashion-forward wearables and home accessories with strips of cotton, wool, fleece, and other fabrics. 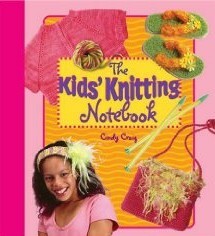 It’s a knitting manual and a journal all in one—designed especially for kids! Using an array of patterns they’ll love and instructions they’ll understand, this notebook introduces the wonderful craft of knitting, and also gives plenty of space to attach swatches, pictures, and notes. It even includes check-off boxes so readers can mark what they’ve completed. What a fun way for them to scrapbook and track their progress! Beginning with the basics—yarn, needles, and other gadgets—the guide moves on to a sequence of fabulous projects that build logically on one another. There are tank tops, customized flip flops, headbands, legwarmers, and cashmere cuffs, plus accessories, including an MP3 player holster. Clear, colorful shots of finished projects and how-to illustrations make learning easy. 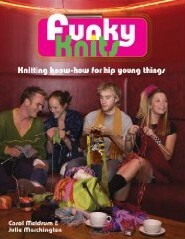 Pick up this book, grab your needles and become a Knitchick! 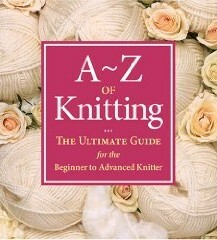 The Knitchicks present a comprehensive, practical, hands-on guide to knitting any sweater you could possibly want. No need to fear, because each of the designs is easy to knit, totally wearable and comes with a hearty helping of Knitchick personality. ItÂ’s time to have fun with your sticks! more than 25 simple, classic sweater designs for women, men and children. information that will help you understand patternsÂ—not just follow them. Adjust the patterns for a perfect fit, or even design your own. step-by-step photographs of all the need-to-know techniques--no reference books required! 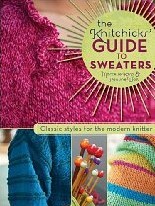 Let the KnitchicksÂ’ teach you sweater savvy and show you how to declare your knitting independence! These 13 trendy sweater patterns from Joyce Wang are perfect for the fashionable wardrobe. From casual to elegant, each comes in four sizes for the perfect fit. All are knit in the round with circular and double-pointed needles for a seamless finish. 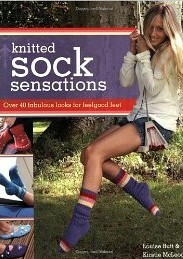 Features patterns that make knitting with gourmet yarns affordable. 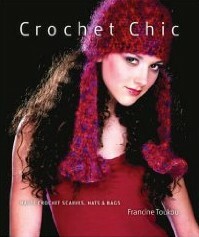 Features selection of crochet projects for knitters wanting to extend their skills. Readers will discover how a little yarn can go a long, long way with 20 irresistible quick-to-stitch knitting and crochet projects, each requiring only two balls of yarn, or less, to complete. Say goodbye to old wool and humdrum cotton and hello to fun fleeces and fur, funky twists of ribbon, luxurious lurex and beautiful bouclé. 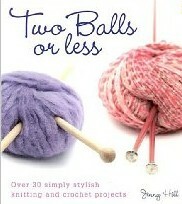 As the projects in this book only need two balls, readers can afford to experiment! Experienced knitters can extend their skills by experimenting with crochet, whilst beginners will love the quick-to-stitch designs. 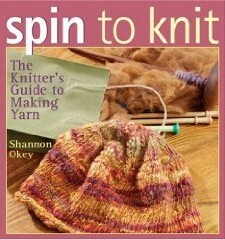 Features helpful tips and techniques to help readers get the best from this exciting new generation of yarns. Dress it up, dress it down—or how about a night on the town? Do it all with a knitted tee! This wardrobe staple gets a modern makeover in this fashionable collection. Start with a basic tee, then build up to designer edgings and eye-catching pattern stitches. Keeping babies warm is so important to their health! That's why Glenna Anderson Muse designed these knit hats for babies in the hospital where she works as a respiratory therapist. So that every baby can have a cozy cap, the sweet patterns are written for three sizes of preemies and three sizes of term babies (newborn, 3-6 months, and 12 months). Each of the 19 designs uses medium weight yarn and is based on one of four basic hat styles: Basic Paper Bag Hat, Basic Jester, Basic Beanie, and Basic Cone. Seasonal looks include bunny ears, springy curls, patriotic stripes, and Halloween and Christmas characters, but the hats look just as adorable without a holiday theme. Each design is an opportunity to make gifts of love for the babies who need them! Not your grandmother's knitting bookThe new needle arts enthusiasts are young and hip. Most are either new to needle arts or are crossing over from knitting to crocheting and vice versa. 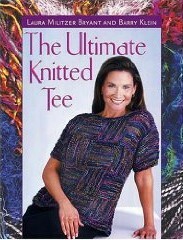 This book presents knitting as a fresh and exciting leisure activity, dispelling any former notions of the hobby as grandmotherly. Each fun project in The Knitter's Guide to Yarn Cocktails teaches a specific skill so techniques can be learned in easy increments. The simple patterns offer a mixture of techniques which are the ingredients for learning more advanced projects. Angled toward the younger needle arts enthusiast, each project is inspired in name and attitude by a popular drink. By completing a "Yarn Cocktail" pattern, the reader will have created a beautiful unique accessory or garment and mastered a new knitting skill, and be empowered to tackle a more challenging project. Each pattern is accompanied by a recipe for the drink that inspired it, encouraging needle artists to knit as a fun social activity. 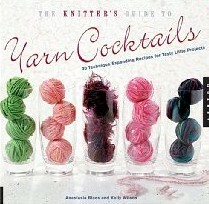 But remember, the authors' motto is: Yarn Over, not Hangover!